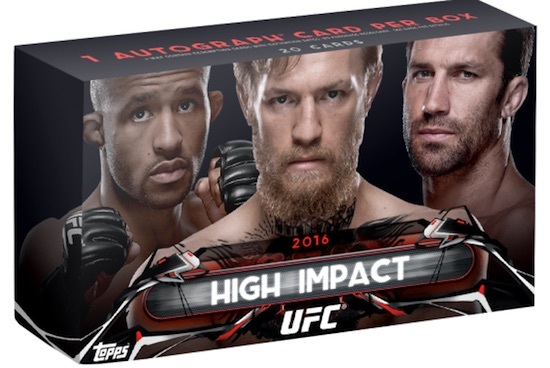 A smaller product featuring key fighters from the Ultimate Fighting Championship, 2016 Topps UFC High Impact is an online-exclusive release with a focus on strong photography. 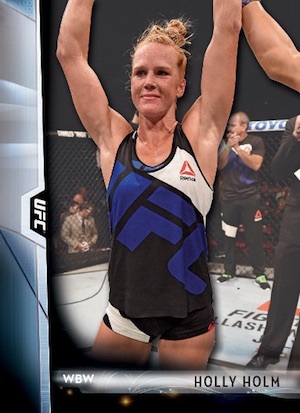 The release includes both base cards and autographs as well as an insert based around the top female fighters. 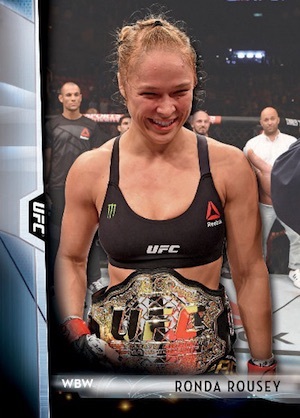 The 50-card base set highlights many of the top names in UFC and collectors can also find a limited Autograph set that offers 43 fighters including Ronda Rousey and Conor McGregor. The simple release also features one insert in the form of a 20-card Femme Fighters set. Showcasing current stars and former greats, the insert chronicles the legacy of female fighters in the UFC. Boxes include 20 cards per box with one guaranteed autograph and a price tag of $24.99. The product is sold directly through the Topps Online Store. These are mock-up images and not final cards. Contents and designs subject to change.